The top ten consumer electronics retailers in the U.S. collectively generate more than $170 billion in retail sales each year. The greatest area of and opportunity in the U.S. for the past five years has been in the consumer electronics space. When the went into a meltdown during the Great Recession, the two companies that provided hope to the entire were Apple and Amazon, fueled by their explosive consumer electronics sales. That's why some of the most frequently asked questions about the U.S. retail industry are about the mission, vision, and values that drive the largest consumer electronics retail chains. How did Amazon's mission statement contribute to a 267% growth in consumer electronics over a five-year period between 2010 and 2014 while the consumer electronics sales at Best Buy, Walmart, Dell and GameStop declined in the same time period? When judged by traditional standards, it doesn't seem possible that Apple's mission statement could possibly create the kind of guidance and motivation that rapidly expanding companies need to maintain and deliver a consistent . But it's easy to see that in place of a traditional formulaic corporate mission statement, Apple had founder that inspired and aligned the Apple employee team. More than any other niche, the largest consumer electronics retail chains need to be on the leading edge of retailing because their target market is filled with customers on the leading edge of technology. As such, it isn't surprising that the largest consumer electronics retailers seem to lack traditional mission statements. It's important to note that traditional mission statements are not guaranteed predictors of success. Nothing illustrates that better than retail companies in the consumer electronics sector. , Circuit City and Radio Shack all had business school-ready mission statements and those mission statements led all three through the doors of bankruptcy court. What matters for all of the in general, and consumer electronics retailers, in particular, is that the company leaders need to have an agile vision in order to maintain retail relevance in their fastest moving niches of the quickly shifting business of retailing. And from that vision, some sort of "mission" and values need to be provided to employees at all levels to provide them with meaningful guidance for their daily decisions and actions. 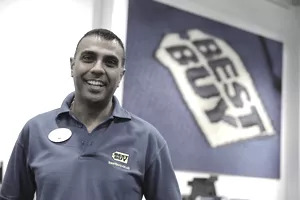 What follows are the mission, vision and values of the largest U.S. consumer electronics store retail chains which define their brand, culture, and ultimately their customer experience. Although they are not solely consumer electronics retailers, the mission statements of Amazon, Staples, Target, and Walmart are included here because they are top ten U.S. electronics retailers, in terms of sales. Click the links to see the complete mission statement of each retail company, along with and information about each.